Megan Gates is an active blogger who provides written work to the blogosphere pertaining to NYC Rentals . Long Island Real Estate, home improvement and the latest architecture, design and fashion. Follow her on twitter @MEGatesDesign. Even though summer is winding down, you might still be looking for easy ways to keep your children occupied. Here are a few easy summer craft ideas that will keep your little ones(and even you!) entertained and creative. Pinecone Bird Feeder: Any time of year is a good time to watch the birds out your window, but when summer turns to fall, the sounds of birds chirping is therapeutic. Make a pinecone bird feeder. This craft project ranks on the easy scale. It requires nothing more than a pinecone, string, peanut butter and birdseed. Tie the string close to the top of the pinecone and have your child spread peanut butter all over it. Lie out some birdseed on a paper plate & then let your child roll the pinecone through it. Choose a tree to hang it in and your whole family can watch as the birds feed off of it. 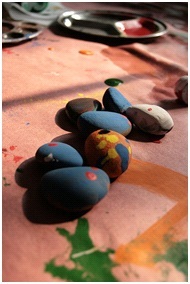 Painted Rocks: This craft project is probably the easiest and oldest one around. This will get your kids outside and creative. You will only need a few materials– acrylic paint, glue, beads, googly eyes and perhaps markers. Children can spend hours searching for the best-shaped rock and making it their own. So Easy! Have them pick a few rocks, wash them off & let them show off their Picasso skills. Bigger rocks can be put in the garden for decoration and smaller ones can be brought inside to act as a paper weight and decorate a desk. Puffy Paint/Fabric Paint: This project is a fun one for kids to really let their creativity loose on! Buy your children canvas sun hats, sneakers or even t-shirts and let them design their own clothes. Using fabric paint (puffy paint) and markers, let your children decorate their articles for a one of a kind look. Tie Dye Shirts: Following the clothing theme, tie dye shirts are always a fun craft. Whether you buy a kit or just dye itself, be sure to protect your work area with plastic (doing this project outside is the best way),. Protect your child’s hands with gloves, and be sure to wear clothes that are okay to get dirty in case of spills. Follow the directions of your kit, or search online for fun ways to make designs with the tie dye. After the shirt has been washed and dried, your children can enjoy their new homemade shirt! Tie-dying shirts looks like fun. I should try that sometime with my daughter, as we are running out of things to do together.